Nuclear diplomacy with North Korea has a bad history by most journalistic accounts. That bad history, however, is mostly just bad journalism. The latest example is Russell Goldman’s erroneous account in the August 18 edition of the New York Times. The negotiating record is much more successful than he or other journalists acknowledge and far superior to the record of pressure of sanctions and isolation without negotiations. Any achievements have been temporary, however, because neither side kept its commitments or sustained negotiations. At the root of that bad history is a misreading of Pyongyang’s purpose, which has never been about blackmail or money. During the Cold War, Kim Il Sung played China off against the Soviet Union to maintain his freedom of maneuver. In 1988, anticipating the collapse of the Soviet Union, he reached out to improve relations with the United States, South Korea and Japan in order to avoid becoming overly dependent on China. That has been the Kims’ main aim ever since. For Washington, suspension of Pyongyang’s nuclear and missile programs was the point of these agreements, which succeeded for a time in shuttering the North’s production of fissile material and stopping the test-launches of medium and longer-range missiles. Would North Korea have kept its word? No one will ever know because both agreements collapsed when Washington did little to implement its commitment to improve relations and Pyongyang reneged on denuclearization. The 1994 agreement is a case in point. Not only did the North shut down its 5 MWe reactor and reprocessing facility at Yongbyon under inspectors’ watchful eyes, but it also stopped construction of two much larger reactors that together were capable of generating 30 bombs’ worth of plutonium a year, by US estimates. No sooner had the agreement been concluded than Republicans took control of the House and Senate, putting it in jeopardy. In 1997, after the Clinton administration had taken only minimal steps to end enmity, was slow to get the reactor project off the ground, and seldom delivered promised heavy fuel oil on schedule, Pyongyang began warning that if Washington did not live up to the Agreed Framework, it was not obliged to either. It then began to acquire the means to enrich uranium from Pakistan and elsewhere. Yet it made no attempt to reprocess the spent fuel stored under inspection at Yongbyon or to restart its reactor. Indeed, it let its other nuclear facilities deteriorate to a point where they could not be salvaged. Pyongyang tried again to get Washington to end enmity, this time offering to curtail its missile programs as an inducement. The United States had begun missile negotiations with North Korea in 1996 but had held just two rounds of talks, hardly a sign of seriousness. On June 16, 1998, North Korea made public an offer to negotiate an end not only to its missile exports but also to “development”—its word—of new missiles. It linked that offer to the conclusion of a “peace agreement.” Along with the offer, it issued a threat to resume missile tests, a threat the North carried out on August 31 when it launched a three-stage rocket, the Taepodong, in a failed attempt to put a satellite into orbit. Former Secretary of Defense William Perry broached the possibility of a missile deal in talks in Pyongyang in May 1999. He also gave the North a draft of a joint communiqué that would be issued during the visit to Washington of Marshal Jo Myung Rok, vice chairman of the National Defense Commission, in October 2000, pledging “steps to fundamentally improve…bilateral relations,” including “replacing the 1953 Armistice Agreement with permanent peace arrangements.” It was explicit about an end to enmity: “As a crucial first step,” it noted, “neither government would have hostile intent toward the other.” That helped pave the way for the first ever North-South summit meeting. It also led to the resumption of missile talks and North Korean acceptance of a test-launch moratorium while the talks proceeded. In October of 2000, we had already come to a full verbal agreement on a detailed agreement on North Korea, by which they would agree to give up their nuclear program, and their long-range missile program. We were, I think, three to six months from having a signed, formal, agreement for doing that. Persuaded that President-elect Bush would continue the negotiation once in office, Clinton decided to leave the matter to him. Clinton’s assumption proved wrong. Usually there is enough trust in an experienced negotiator that the guidance is used more as points of reference than as a script. But in this case, given the fissures, the points were to be read verbatim. There were literally stage directions for Kelly. He was not to engage the North Koreans in any side conversation in any way. That left him actually moving to the corner of the table to avoid Pyongyang’s representatives. Instead, administration officials claimed that the North Koreans had “admitted” they had an enrichment “program” and said they should be punished. They overcame resistance from South Korea and Japan to suspend shipments of heavy fuel oil, thereby tearing up what little was left of the Agreed Framework. While US forces were tied down preparing to invade Iraq, North Korea retaliated by reprocessing the five or six bombs’ worth of plutonium, which, when weaponized, would allow it to conduct nuclear tests for the first time. It also moved to restart its plutonium reactor, ramped up imports of enrichment equipment, and aided Syria in constructing a reactor of its own. The North’s nuclear effort, largely held in check for a decade through negotiations, was now unleashed. Bush’s initial response was to ignore North Korea’s nuclear actions while hard-liners in his administration began touting regime change. On the very day that Saddam Hussein’s statue was toppled from its pedestal in Baghdad, Assistant Secretary of State John Bolton said, “We are hopeful that a number of regimes will draw the appropriate lesson from Iraq.” Far from making Pyongyang more pliable, however, the war on Iraq strengthened its determination to arm. As a DPRK Foreign Ministry spokesman noted on April 6, 2003, “Only military deterrent force, supported by ultra-modern weapons, can avert a war and protect the security of the nation. This is the lesson drawn from the Iraqi war.” Yet Pyongyang was still prepared to suspend arming if Washington moved to end enmity. Yet Pyongyang was not about to settle for fine words any more than Washington was. It insisted on phased reciprocal steps by Washington to reconcile—end enmity—as it eliminated its nuclear programs. The September 19, 2005, joint statement embodied that point: “The six parties agreed to take coordinated steps to implement the aforementioned consensus in a phased manner in line with the principle ‘commitment for commitment’ and ‘action for action.’” The accord laid out some of the steps Pyongyang sought. The United States undertook to “respect [the DPRK’s] sovereignty,” diplomatic code for not attempting to overthrow its government. It stopped short of agreeing to normalize relations, wanting the North to reduce its forces along the DMZ and embrace human rights first. 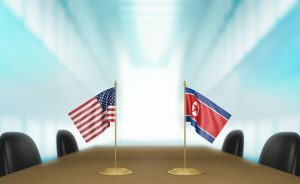 At the urging of the other parties, Washington committed to “respecting” Pyongyang’s right to nuclear power and “agreed to discuss at an appropriate time the subject of the provision of light-water reactors [LWRs] to the DPRK.” The North would not be entitled to reactors until it eliminated its weapons and weapons programs to the satisfaction of the International Atomic Energy Agency and rejoined the NPT as a member in good standing. How much the freezing of North Korea’s hard currency accounts curtailed its trade is unclear, but it looked a lot like regime change to Pyongyang, which responded by refusing to return to Six Party Talks until its accounts at the Banco Delta Asia were unblocked. In talks in New York on March 17, 2006, it proposed a bilateral US-DPRK mechanism to resolve the issue. Hill, however, was not allowed to meet with the North Koreans. Far from giving Washington leverage, the financial sanctions provoked Pyongyang to begin preparations for missile test launches. When a high-level Chinese delegation came to Pyongyang to urge top officials to call them off and warn of UN action, they were kept waiting for three days—and then ignored. The July 4, 2006, fireworks display, conducting seven test launches including the Taepodong-2, prompted China to vote for a US-backed resolution in the UN Security Council condemning the tests and threatening sanctions. Undaunted, North Korea immediately began preparations for a nuclear test, which it carried out on October 9, 2006. It was demonstrating that it would never bow to pressure—whether from the United States or China or both. Only US moves to end enmity would get it to change course. The ultimate goal of the DPRK is not “denuclearization” to be followed by its unilateral disarmament but one aimed at settling the hostile relations between the DPRK and the U.S. and removing the very source of all nuclear threats from the Korean Peninsula and its vicinity. “The North Koreans successfully gamed the United States,” Russell Goldman claims. Far from it: when President Bush took office, thanks to diplomacy, North Korea had stopped testing longer-range missiles. It had less than a bomb’s worth of plutonium and was verifiably not making more. Six years later, as a result of Washington’s broken promises and financial sanctions, it had seven to nine bombs’ worth, had resumed longer-range test launches, and felt free to test nuclear weapons. The strategy of pressure had failed. A second-phase agreement on October 3, 2007, committed the North to provide “a complete and correct declaration of all its nuclear programs” and put Pyongyang on a path to disable its plutonium facilities at Yongbyon, making it more time-consuming and costly to restart and thereby whittling away its nuclear leverage. In return, the other parties pledged to supply the North with energy aid and the United States agreed to ease sanctions under the Trading with the Enemy Act and delist the DPRK as a “state-sponsor of terrorism.” The second-phase agreement said nothing about verifying the North’s declaration, which was left to a subsequent phase of implementation. On June 26, 2008, the DPRK handed China a written declaration of its plutonium program, as required by the October 2007 accord. North Korea reportedly declared it had separated 38 kilograms of plutonium—within the range of US estimates, albeit at the low end. In a side agreement with Washington, Pyongyang committed to disclose its enrichment and proliferation activities, including its help for Syria’s reactor. Many in Washington, Tokyo and Seoul questioned whether the declaration was “complete and correct,” as required by the October 2007 agreement. The crux of the dispute was how much plutonium the North had separated before the end of 1991. In bilateral talks with Hill, the DPRK agreed to allow “sampling and other forensic measures” at the three declared sites at Yongbyon—the reactor, reprocessing plant, and fuel fabrication plant—which might suffice to ascertain how much plutonium it had produced. If not, he also accepted “access, based on mutual consent, to undeclared sites,” according to a State Department announcement. Yet Japan and South Korea insisted the North’s commitment be put in writing and insisted on halting energy aid. Washington went along. The North responded to the suspension of promised energy aid by assembling a rocket at its Musudan-ri launch site starting in late January 2009. It did not launch the rocket until April 5, giving the incoming Obama Administration more than two months to undo North Korea’s walk-back or open talks to resolve the issue. It did neither. The DPRK Foreign Ministry responded within hours, saying that “nuclear abandonment has now become absolutely impossible” and warning that all the plutonium it had just removed from its reactor would “be weaponized” and that its uranium-enrichment program would move beyond the test phase to an operational plant.” As it had in 2006 when Washington and Beijing had agreed on sanctions at the UN Security Council, Pyongyang then conducted a nuclear test to drive them apart. It was demonstrating once again that an end to enmity with Washington, not tougher sanctions by Beijing, was the key to denuclearization. Once again, the resort to pressure had failed to stop North Korean nuclear and missile advances. Now, Washington is again pressing Pyongyang to accept talks on its terms. If the past is prologue, pressure without negotiations to end enmity is a recipe for failure. Russell Goldman, “How Trump’s Predecessors Dealt with Korean Threat,” New York Times, August 18, 2017, p. A-10. “Nobody Can Slander DPRK’s Missile Policy,” Korean Central News Agency, June 16, 1998. US-DPRK Joint Communique, October 12, 2000. As President Clinton described the deal this way, “They stop missile development and the sale of missiles. Now, they obviously need to earn some funds from some other places and we think there are ways they can do that.” (White House transcript of Associated Press interview aboard Air Force One, November 4, 2000.) North Korea’s version is in “Conclusion of Non-Aggression Treaty between DPRK and US Called for,” Korean Central News Agency, October 25, 2002. William J. Perry, Transcript of a 38 North Press Briefing, Washington, January 9, 2017. Doug Struck, “North Korean Program Not Negotiable, US Told N. Korea,” Washington Post, October 20, 2002, A-18. Condoleezza Rice, No Higher Honor: A Memoir of My Years in Washington (New York: Crown, 2011), 161 (emphasis in original). Guy Dinmore, “Heed Lesson of Iraq, US Tells Iran, Syria, and North Korea,” Financial Times, April 10, 2003, 4. “Statement of Foreign Ministry Spokesman Blasts UNSC’s Discussion of Korean Nuclear Issue,” Korean Central News Agency, April 6, 2003. Joint Statement of the Fourth Round of Six-Party Talks, September 19, 2005. Secretary of State Condoleezza Rice, Press Availability at UN Headquarters, September 19, 2005. “Spokesman for the DPRK Foreign Ministry on Six-Party Talks,” Korean Central News Agency, September 20, 2005. David E. Sanger, “US Widens Campaign on North Korea,” New York Times, October 24, 2005, p. A-7. Mike Chinoy, Meltdown: The Inside Story of the North Korean Nuclear Crisis (New York: St. Martin’s Press, 2008), 269. “DPRK Foreign Minister Clarifies Stand on New Measures to Bolster War Deterrent,” Korean Central News Agency, October 3, 2006. Initial Actions for the Implementation of the Joint Statement, February 13, 2007. Choe Sang-hun, “Lee Plans to Harden Seoul’s Line with North Korea,” International Herald Tribune, December 20, 2007; Jung Sung-ki, “Peace Zone Project Faces Derailment,” Korea Times, December 30, 2007. US Department of State, Office of the Spokesman, “US-North Korea Understandings on Verification,” October 11, 2008. “DPRK Foreign Ministry Statement,” Korean Central News Agency, June 13, 2009.